Contains 120 x 1000mg tablets of 100% ultrapure amino acids (protein building blocks) from vegan sources. Free from all additives. Pharmaceutical Grade (not just food grade). Sourced from Legumes (mainly peas). No additives (No binders, lubricants or anything). Enables High Dietary Ketosis when used as a protein replacement. Reducing blood glucose levels whilst ensuring muscle mass remains. Building lean muscle mass or reversing muscle wasting. Building skin and connective tissue material. Building immune mass, messengers and metabolic aids. Take 5 MyAMINO® tablets 1-2 times a day with sufficient fluids, best before meals. Cancer patients with wasting, may need up to 10 MyAMINO® tablets 5 times a day. MyAMINO® may also be used for skin beautification. Blend tablets with pure hot water to produce a milky white paste. Apply to face whilst still warm and leave in place for up to 30 minutes. Ayana Mishelle H. on 12/Aug/2018 Great source of natural amino acids without harmful side effects, help me keep my weight at a normal level without getting to small. Devny H. on 14/Jun/2018 Great product. Significantly helps with wasting. As per the MyAMINO product page "Cancer patients with wasting, may need up to 10 MyAMINO® tablets 5 times a day." Your purchases seem to indicate your dosage is up to 10 tablets a day which appears insufficient. Increase your dosage. Ayana Mishelle H. on 01/May/2018 I am 100% satisfied with this product. I was losing weight and could not stop, on a 100% plant based organic diet so I was eating well, I started on this product and the " wasting" type symptoms have disappeared. My weight is stable and I look like my beautiful self again. I tried other brands but this one did the job. I have ordered this product several times and will continue to do so.The price is also good and competitive with what I paid for the other brands. Flaviana A. on 08/Jan/2018 Taste not so good but a very good booster. Wayne M. on 21/Nov/2017 These capsules are quite easy to swallow; such an easy way to ensure my useable protein requirements are met. Sarah M. on 09/Nov/2017 Excellent product- great protein supplement! Gloria A. on 21/Oct/2017 as I only eat a small amount of meat. Momentan comanda nu a fost livrata. I like using the MyAminos but they should tell how many grams of each AA are in each tablet so the customer can increase or decrease as needed. This is a major drawback to this product so I am considering switching to something else. The amount of each Amino Acid in each 1000mg tablet is listed on the product page and the MyAMINO science page. Rita P. on 27/Jun/2017 I have not noticed any one particular improvement. I have only taken one bottle thus far though. Antionette P. on 03/Mar/2017 The dosage say to give 5 tablets daily. My son has autism and I have increased the dosage to 2 tablets going very slowly as he is extremely sensitive. At this stage I'm trailing the Autism Protocol. He is much calmer. Kimberly B. on 20/Nov/2016 Great product for protein especially for those who cannot eat meat, no toxic waste. Kelvin S. on 23/Aug/2016 Really helping to reduce pancreatic pain and they aid in digestion. Used along with Megazyme forte enzymes (apricotsfromgod.com) which has high pancreatin, trypsin and Chymotrypsin, the digestion thing is better managed. They are also helping with appetite and cachexia. Dee A. on 10/Aug/2016 Love these ! They help to rebuild your muscle mass!! Monica M. on 10/Aug/2016 fantastic!!!!! 10 MyAMINO® tablets introduce the same amount of protein, that builds up the body, as 350g (12 ounces) of meat, fish or poultry. 99% 32% avg. 16% avg. 1% 68% avg. 84% avg. Only when all 8 essential amino acids are available at the same time and in the correct ratio to each other can our body use them to repair and build cells. In any other case the nutritional value of the amino acids is lowered dramatically and body protein synthesis is much lower. Then the amino acids are broken down, producing toxic nitrogen waste, which must pass through the liver and kidneys. This degradation of amino acids also produces glucose, which diabetics or people who follow a low-carb diet can avoid by taking MyAMINO®. 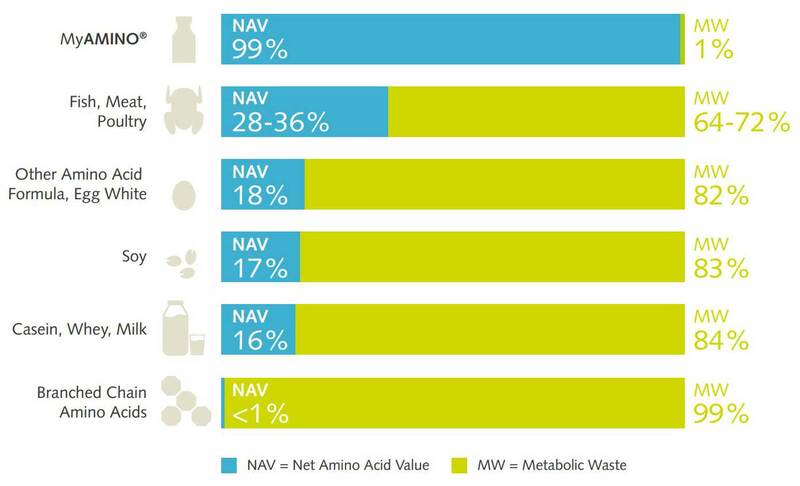 Rate of Net Amino Acid Value (NAV) compared to nitrogen waste in food proteins. Increased body muscle mass, strength, and endurance. Greater improvement in performance of the nonprevailing muscles compared to the prevailing ones. Improved muscular and hematologic lactate clearance, which allows for better muscle performance and faster muscle recovery after physical activity. Increased red blood cells, hemoglobin, and hematocrit parameters. Nitrogen balance could be maintained in equilibrium with essentially no calories (MyAMINO 1g=0.04 kcal). Preserved the body´s structural and functional proteins. Eliminated excessive water retention from the interstitial compartment. Prevented the sudden weight increase after study conclusion commonly known as the yo-yo effect. Prevented flabby tissue, stretch marks and sagging of breast tissue. Prevented increased hair loss, faded hair color, and fragile or brittle nails. Prevented hunger, weakness, headache caused by ketosis, constipation, or decreased libido. Achieved a mean weight loss of 1.4kg(3) per week and 2.5kg(4) per week. (1) Lucà-Moretti M, Grandi A, Lucà E, Mariani E, Vender G, Arrigotti E, Ferrario M, Rovelli E.
(2) Lucà-Moretti M, Grandi A, Lucà E, Mariani E, Vender G, Arrigotti E, Ferrario M, Rovelli E.
(3) Lucà-Moretti M, Grandi A, Lucà E, Muratori G, Nofroni MG, Mucci MP, Gambetta P, Stimolo R, Drago P, Giudice G, Tamburlin N.
(4) Lucà-Moretti M, Grandi A, Lucà E, Muratori G, Nofroni MG, Mucci MP, Gambetta P, Stimolo R, Drago P, Giudice G, Tamburlin N, Karbalai M, Valente C, Moras G.
A Comparative, Double-blind, Triple Crossover Net Nitrogen Utilization Study Confirms the Discovery of the Master Amino Acid Pattern. Annals of the Royal National Academy of Medicine of Spain, Madrid; Vol. CXV: 397-416, 1998.